Dr Jackson's Leather Conditioner is a quick and easy way to keep your veg-tanned leather in the best condition. 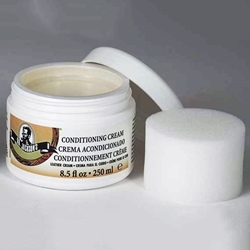 The combination of natural and synthetic wax emulsions, with the addition of beeswax, make this a unique conditioning cream. It provides a bright gloss and a silky smooth softness to leather. Apply with included sponge. Not for use on suede. Recommended for our light leather armor, belts, boots and pouches.